Vent-Lock™ safety venting cam and groove couplings allow the operator to relieve pressure safely prior to full disconnection. This feature greatly reduces the risk of blow back, and minimizes the chance of accidental disconnection of a pressurized line. Vent-Lock™ adapters have a notch that must be aligned with the specially designed cam arm in the mating coupling in order to separate the coupling set. In order to engage the cam arms, these notches must be aligned and then rotated 90 degrees. When the cam arms are released the cam lock coupler will expel any pressure, but the coupling set will be unable to release until the coupling arms are aligned with the specially notched cam adapter. A swivel in built into the female coupler allows an easy turn of the assembly. This prevents powerful recoil of a hose under pressure and contains hazardous spills. 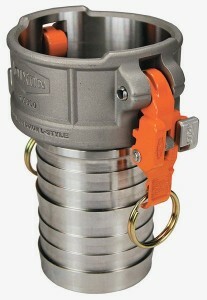 Note: Vent-Lock couplings now feature an orange poly tab on the lower portion of the handle rather than an orange coated handle as is shown in the video and photo.